Was an election for Mayor of Carrollton upheld even though voters were threatened and intimidated from voting? 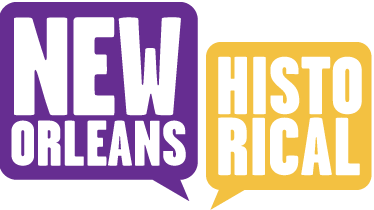 Yes, the Louisiana Supreme Court ruled in 1858, reversing District Judge Victor Burthe. The annual election for Mayor and Councilmen in the Town of Carrollton was set on April 5, 1858. Voters could choose between the “Mason” ticket, with Benjamin Mason as candidate for Mayor, and the “Citizens” ticket. On the morning of April 5th, a gang of between 20 and 30 "ruffians" arrived in Carrollton on the 8:00 a.m. train. This armed gang, many of whom were recognized as belonging to the New Orleans Police Department, carried “bludgeons, pistols and ‘bowieknives.’” The “degraded banditti” paraded around Carrollton, threatening that “there would be more Dutchmen killed than had ever been seen before,” if the “Mason” ticket was not elected. The ruffians, which included the likes of “Red Bill” and “Big Tom,” knocked down the first voter who appeared at the polls, rang the fire alarm three different times, and fired pistols in the air creating a panic and scaring potential voters. Only 73 persons cast votes; 69 of those votes were for the “Mason” ticket and four votes for the “Citizens” ticket. A foundry-man named Simmons was shot and killed in a coffeehouse. Carrollton residents argued that Benjamin Mason and the “Mason” ticket usurped their offices and the election was null and void. After a hearing in the Carrollton Courthouse, District Judge Victor Burthe agreed that the election was null and void and ordered another election to be held. Benjamin Mason appealed to the Louisiana Supreme Court, which upheld the election. The highest court found that Carrollton residents were not proper parties since they were not candidates for office. If every citizen had the right to contest an election, more disorder would result than “the occasional defeat of the will of the majority.” The court also observed that Benjamin Mason did not interfere with voters’ rights or participate in any act of violence himself. 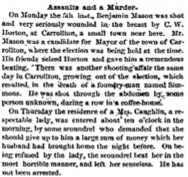 Ironically, Benjamin Mason was also the victim of violence on that election day; C.W. Horton shot and seriously wounded Mason, whose “friends” retaliated and beat up Horton. Mary Ann Wegmann, “Election Intimidation, Carrollton, 1858,” New Orleans Historical, accessed April 24, 2019, https://neworleanshistorical.org/items/show/411. State v. Mason, No. 5848, 14 La. Ann. 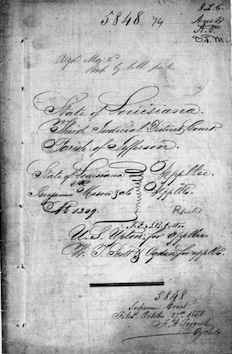 505; 1859 La. Lexis 296 (La. June 1859). Historical Archives of the Supreme Court of Louisiana, Louisiana and Special Collections Department, Earl K. Long Library, University of New Orleans.